You might wonder how you are ever going to store all of the "bathroom" stuff in such a small space. With the right organization scheme, you can find a place for everything. The tips in this section can help you keep your bathroom in great shape. You'll find some great ideas for organizing jewelry, magazines, and hair care products. There is also information about storing toiletries and keeping your bathroom tidy. The following articles are available for the 'Bathroom' topic. Click the article''s title (shown in bold) to see the associated article. Using shelves in your bathroom is a great way to keep things neat and organized. If you don't already have shelves in your bathroom, you can put one over your toilet, on the counter, or wherever there is room. 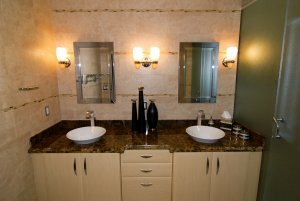 Although the bathroom tends to be a small space, you can still manage to keep it organized by properly storing items. Try some organization ideas that will allow you to make the most of the room in your bathroom. Does your medicine cabinet look like a small hurricane went through it? Are you scared to open your medicine cabinet door, thinking that you might get hit by something falling out of it? For whatever reason, if you have answered yes to these questions, then you need a little help in creating a clutter free medicine cabinet. Because most bathrooms tend to be on the small side, it only stands to reason that there isn't going to be a whole lot of room for storage in them. Because of this limited amount of storage space, a little creativity is in order. Here are some great ideas for creative bathroom storage that anyone can use. Is your bathroom full of things you know don't belong there? Or are you at a loss as to where to start emptying it out? Have a look at these articles and see if they help. Many items can accumulate in your medicine cabinet over time. Take a few minutes to throw away unneeded items and to organize medications and bottles. You will be amazed at how de-cluttering the medicine cabinet can really help organize the entire bathroom. Did You Know Toiletries Have Expiration Dates? Toiletries tend to clutter up anyone's bathroom. When you next begin to organize your bathroom, go through your toiletry products and keep only the ones that are still any good. Here are some guidelines for you to keep in mind when doing this. Experts say that a bathroom is one of the top 10 places to think, so why not organize yours' to help induce better thinking habits? Here is how you can do just that. Are you frustrated with the tangled mess of jewelry in your drawer and not finding that special necklace? Not to worry, there is a solution in sight. Read on for a great idea. Typically, in most bathrooms, one of the largest contributors to the clutter is your hair-care products. If you don't come up with a way to organize these products, you are always going to have a messy bathroom. Here is a simple method that anyone can use to ensure everything is in its place. Decluttering your bathroom magazines can become a fun continual task. Keeping your magazines organized and updated can create your individual private time entertaining. Storing and organizing medications can often present unique problems. For example, is there a specific place that you should store your medicine to keep it from going bad? How do you go about organizing your medicine so that it doesn't become old or outdated? Well, the answers are a lot simpler than you would have believed. What is it about a bathroom that seems to make it a gathering and collection point for the rest of your home? Here are some rather simple steps that anyone can take advantage of in order to create a superbly organized, and tidy, bathroom. FREE SERVICE: Receive an e-mail several times each week with a featured organizational tip. Enter your address and click "Subscribe."